Poet, punk, photographer, author…it’s far too fashionable for artists to decide that talent in one form means that they are talented everywhere else, but Patti Smith is one of the few who has earned her titles. Since her last album, she has won the Polar Music Prize, the National Book Award, and received a pair of honorary doctorates—quite remarkable. 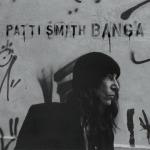 So it’s hardly a surprise that Banga, Smith’s first album of original material in eight years,sounds so unique yet so familiar. It is the album that all of her non-musical endeavors suggested she would make from the beginning. “We were going to see the world,” Smith says about two seconds into the album. It’s not quite the opener that “Jesus died for somebody’s sins, but not mine” is, but it is certainly a perfect introduction to Banga, and Amerigo goes on to imagine Amerigo Vespucci’s voyage to America at the end of the 15th century. Exploration of the world is certainly the theme here both lyrically and musically. Fuji-San acts as a prayer for the people of Japan following the 2011 earthquake, while Mosaic uses a mandocello but sounds distinctly Eastern in its use. Smith also has a couple songs inspired by Russian literature, April Fool and Banga, whose influences aid the worldly theme as nicely as the assured lyrics, and Banga in particular provides an energetic note on an album that is, as a whole, quite slow. It’s Smith at her best—a great song and a peculiarity on the album that nonetheless makes perfect sense there. The penultimate track, Constantine’s Dream is just as successful. An introspective meditation in which dreams become reality and one’s own mind becomes a world in itself, the story circles back to the New World but adds religion and artistry into the mix, driven forward by a powerful string-section and guitar-work that recalls what Kevin Shields did for Smith on The Coral Sea. When Banga delves away from its worldly exploration, it’s always as an elegy or a tribute. This Is the Girl is a misfire written for the late Amy Winehouse; it unfortunately drags through its four minutes, and it fails to reach the emotional high of the songs around it or of the more successful elegy, Maria. An ode to Maria Schneider, Maria is the also a well-placed emotional high-point, one where the album’s sense of exploration and observation reaches a logical extreme by taking on the world from the view of a departed, worldly citizen. The elegiac and thematic aspects are both at their most realized. It’s a shame that the same cannot be said of Johnny Depp’s birthday present, Nine, which is a fine song on its own but offers little to Banga. Equally compelling is the mix of sung and spoken word on the album. Amerigo, Tarkovsky, and Constantine’s Dream are the most intriguing and open to scrutiny on the album, but April Fool, Maria, and Banga are sang with a purpose that elevates them to the same level of quality. The spoken tracks make it easy to notice the poetic qualities of the ones she sings, and in turn those that she sings allow us to notice her prose in the spoken word. In addition to the musician, we get the beat-poet and the author on Banga, and it never feels forced. Banga owes a large portion of its success to the backing band and impressive list of session musicians (Tom Verlaine among them). In particular, Lenny Kaye displays his growth as a guitarist as effortlessly as Smith displays her growth as an artist. It’s not uncommon to hear a musician say that the most important aspect in finding a bandmate is chemistry. In Lenny Kaye, Patti Smith has found her foil and muse, someone whose growth mirrors hers so precisely that every guitar note on Banga aids its auteurist ambitions. Kaye adds trills, tremolos, and some of his most haunting riffs as if the album is his own. The rest of the band is not far behind, with Tony Shanahan on bass and Jay Dee Dougherty on drums giving the album a mood and assuredness that reflects a vision of sharing the world as much as exploring it. Regardless of who wrote which songs, there’s always a strong sense of unity. Banga unfortunately missteps with an end cover of Neil Young’s After the Gold Rush, an appropriate but obvious statement, and an arrangement whose only difference is a children’s choir at the end, which is more overbearing than anything else. Constantine’s Dream, which, in addition to everything else, comes as close to answering questions about an artist’s purpose as one could hope, would have been a better ending. Still, it’s one of only a handful of misfires on what may be the songstress’s most ambitious statement yet, and it isn’t enough to taint Banga’s greatness. By the end of the hour, you feel like you went to see the world too. Better, you want to see it Smith and company again.